Premier W12 11-3/4" cut heavy duty paper trimmer delivers straight, clean cuts using a fully hardened self sharpening carbon steel blade. Accurately cuts paper, matte board, cardboard, film, tissue, and textiles. Premier W12 11-3/4" cut heavy duty paper trimmer delivers straight, clean cuts using a fully hardened self sharpening carbon steel blade. Its 11-3/4" cutting length is more than enough for standard, letter size paper. Permanent, 1/2" measuring grid provides a useful measuring guide that won't wear out like painted grids. Accurately cuts paper, matte board, cardboard, film, tissue, and textiles. Premier W12 heavy duty paper trimmer cutter features a finger guard that protects the entire blade length and a torsion spring that prevents blade from accidentally falling for increased safety. Patented automatic blade latch locks with every cutting motion for added control. Able to cut 20 sheets at once to save time on trimming. Versatile dual scale rulers in English imperial (inches) and metric system ensure proper alignment. 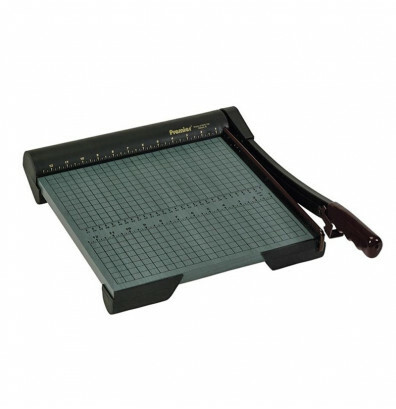 The heavy duty paper trimmer offers an ergonomic soft-grip handle that provides comfortable use. Non-skid feet keep base from slipping on surfaces. Durable 3/4" thick wood base for long-lasting use. Also available in longer cutting lengths. Please see "Related Products" on the right side-bar. Finger guard covers entire blade length for added safety. Accurately cuts paper, matte board, cardboard, film, tissue, and textiles. Torsion spring prevents blade from accidentally falling during use. Rulers scaled in English imperial (inches) and metric system. Non-skid rubber feet reduces slipping on surfaces. 1/2" measuring grid marked on table for precise measurements. Sturdy 3/4" wood base construction. I received a shipment from my supplier for 2,000 pieces of a product insert for our t-shirt experience at GeoTees. Well, the insert was 1/8 in too big, and buckled inside the box. This posed a major problem for me as the customer experience was now compromised. After speaking to a good friend of mine, he recommending a cutting board to correct the issue, so I began the journey of looking for one. My wife is a school teacher, and I had the privilege of borrowing hers in her classroom, and it was the one I later bought. This product is the school standard and does the job! So, I found a place to purchase one and received it shortly after. I have to say, I am very pleased with the product and with the experience from your company. Great job Digital Buyer on fulfilling this order and quickly getting it out to me. I have purchased two office products from DigitalBuyer.com in the past three years, and I am happy with both purchases. 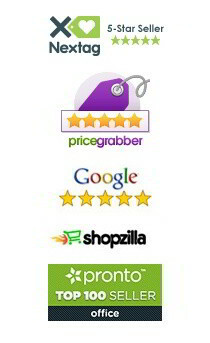 I find the company very reasonably priced, and have good quality products. I think they are nice to do business with, and find they have prompt deliveries. If they have something I need in the future I will certainly do business with them again. I found what I wanted. That's the first thing. I had shopped around the web and couldn't seem to locate the product at a price that was within my budget. But DigitalBuyer.com had exactly what I was looking for. The product was shipped UPS (not my favorite carrier) but it came rapidly, well-packed and wrapped (rainy day). I am using it often and I could not be happier with my purchase. I love the paper cutter!